Every holiday has a unique theme and coloring surrounding their festivities. Apart from their spiritual value, these celebratory events that come around once every year help us leave the routine of our everyday lives behind, and “feel the moment” with our loved ones. 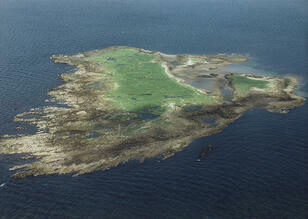 Perhaps one of the most iconic holidays, especially for those living in the Irish diaspora, is Saint Patrick’s Day. On this day, hundreds of thousands dress up in green or wear shamrocks to commemorate Ireland’s foremost patron saint. Aside from the fun and commercialized elements, this holiday holds significant meaning and value for the Island of Éire. 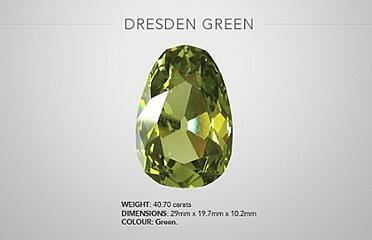 What better way for us to celebrate this historic event than with one the most historic green diamonds of all time; the Dresden Green. The Dresden Green is a truly magnificent pear cut diamond with shaping characteristics such as general facet, small table, and large culet commonly associated with old European styles of modification. Despite the stone being secured in a bezel prong mounting, GIA evaluators managed to weigh the stone at 40.7 carats, deeming it the largest natural green diamond to have ever been discovered up to date. Even though it was cut prior to 1741, the quality of the diamond’s finish is very impressive, receiving a “very good” even by today’s rigid diamond grading standards. Another characteristic that managed to impress the GIA was the stones clarity. Despite its considerable thickness, it is fairly transparent, a very rare characteristic among diamonds. 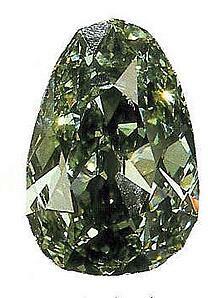 Further, since the stone has very few inclusions, it was given a VS1 grading. According to the GIA, the diamond's color is its most intriguing feature. 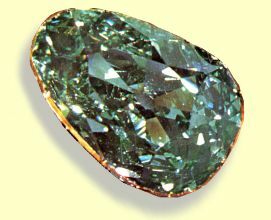 Using their Colored Stone Grading nomenclature, they concluded that the gem is of a medium shade of green with a grayish tone. Being slightly limited by the mounting of the stone, the GIA Gem Trade Laboratory system gave this diamond a Fancy Green grading. Finally, as the stone is nearly free of impurities caused by nitrogen, it was given an IIa grading, a characteristic given to only 2% of naturally colored diamonds. Although great speculation has surrounded the origins of the Dresden Green, it is believed to have come from the Kollur Mine in India. 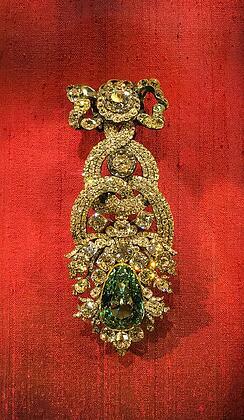 The diamond’s history however is well documented from as early as 1741. The first mention of the stone is in the Inventory Book no.16 located in the Green Vaults of Dresden, Germany. It states that the gem was sold by a merchant named Delles to the King of Poland, Augustus III, during the 1741 Great Annual Easter Fair at Leipzig. A year later the diamond was set as part of a badge fashioned for the Order of the Golden Fleece. In 1746, by King’s order, a new setting was created, this time incorporating numerous small colorless diamonds as well as another one of his famous diamonds, the Dresden White. The greed diamond, along with the rest of the contents of the Green Vaults, was moved to the Konigstein Fortress for safe keeping during the Seven Year War (1756-1763). As you may recall from history, Saxony was defeated, and so the Golden Fleece was dismantled with the part containing the Dresden Green being set as part of a hat ornament during 1768 (in which it currently resides accompanied by other colorless diamonds). The diamond was made available for the public to admire up until the start of World War II. During the years of war, the entire collection of the Green Vaults was stored in Konigstein Fortress until they were transported to Moscow in 1945 for safekeeping (as Dresden was almost completely destroyed). The vaults’ contents were returned during 1958, and in 1959 they were put on display for the first time since 1942. During 2000-2001, the Dresden Green diamond was showcased alongside the Hope Blue in the Harry Winston Gallery of the Smithsonian Institution. By 2004, Dresden’s Palace was also restored along with its Green Vault. This meant that the royal jewels (along with the Dresden Green) were officially “home”, and have remained for public display up to this day. And with that “happily ever after” ending of the story so does our green commemoration. From all of us at Arpège Diamonds, may you have a wonderful Saint Patrick’s Day! Do you have any questions? Let us know! And as always, feel free to follow us on Twitter and LinkedIn. For more reading on colored diamonds, check out the link below. Do You Have This Alternative Investment Asset In Your Portfolio? It's like your own knowledge repository! 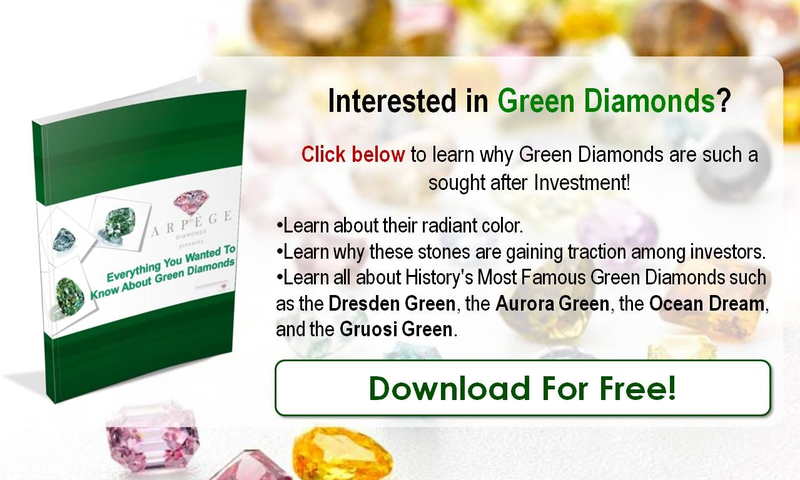 The world of naturally colored investment diamonds and jewlery is fascinating! Auction prices hitting new heights, stars and entertainers wearing new fancy colored diamonds, and backstories on some of the most iconic colored diamonds of all time. You won't want to miss one of our insightful posts! Sign up to receive a notice every time we add a new piece of content.